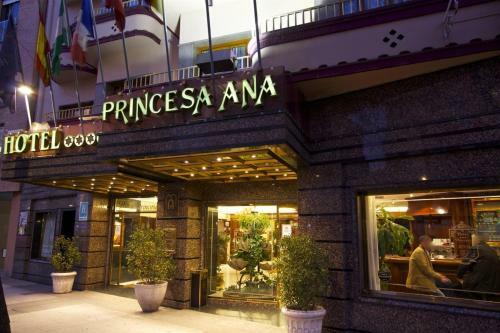 Princesa Ana is located 200 m away from the Renfe train Station and 10 minutes' walk from the cathedral. It offers charming rooms with free Wi-Fi. The hotel has 62 rooms and has been recently refurbished. A concierge, a currency exchange and a 24 hour reception are only some of the features that this charming hotel has to guests. Admire the fashionable materials used in the Princesa Ana's interiors, with furniture by Valentí and many other famous designers. Rooms are comfortable and well-equipped, with full air conditioning. Enjoy a varied buffet breakfast, at an additional cost, including special healthy and gluten-free options. After a day out sightseeing, have a drink at the Princesa Ana's lovely English bar. You can also grab a coffee at the café between meetings in the conference rooms. To ensure your day has a good start, the hotel offers a buffet breakfast each morning. For other meals, there are many restaurants and cafés situated nearby. Room service is also available during limited hours. Situated close to lots of hot spots, the hotel is nearby lots of bars, nightclubs and quality places to eat. Head out past the nearby University into the city, where you can visit the Cathedral and the world-famous Alhambra Palace. At night, take advantage of the 24-hour reception desk to get great dinner recommendations in the local area. This hotel is 2616 metres from the Alhambra entrance, 1582 metres from Plaza Nueva (the absolute centre of Granada), 224 metres from the train station and 1526 metres from the bus station.